Last night the Canal officials (read: Cable Guy) told us to expect our advisors between 6 and 8am. So like clockwork, our advisors showed up at 9am. 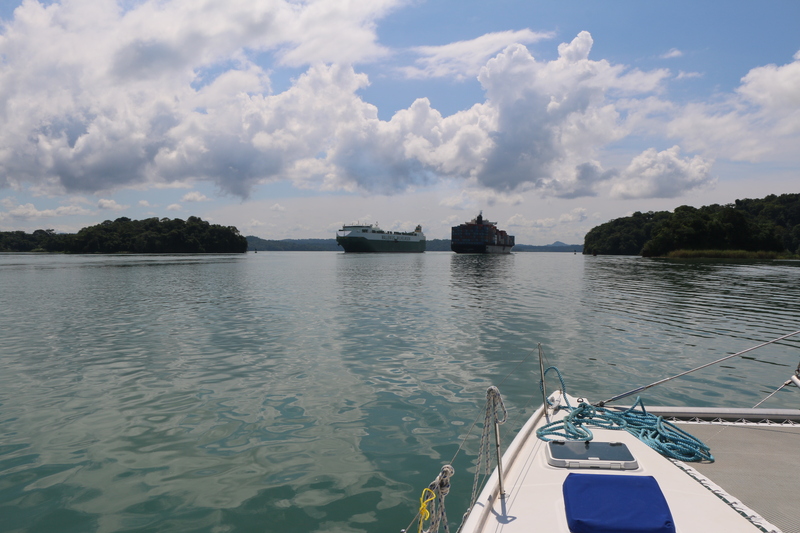 The majority of the day was spent motoring along Gatun Lake and through the Gaillard Cut. 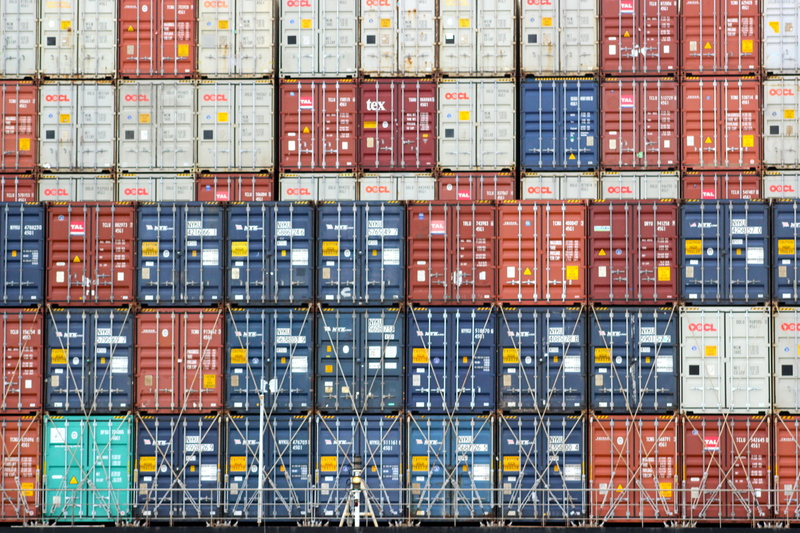 All the while watching the seemingly endless parade of massive container ships, even bigger car carriers, and extremely powerful tugs keeping them all in line. Oceanna was most definitely the pipsqueak on the playground today. Five and a half hours later we arrived at the first lock of the day. 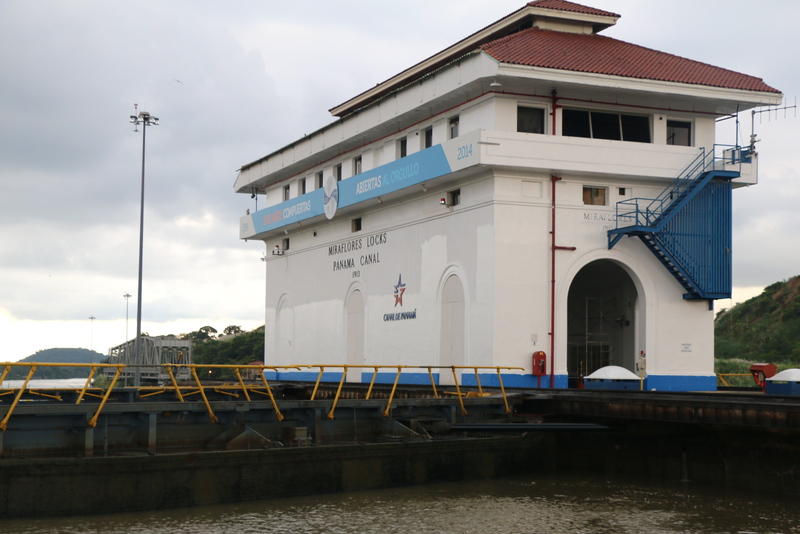 The Pedro Miguel Locks which lower us 29.5 feet from the elevation of Gatun Lake to Miraflores Lake. 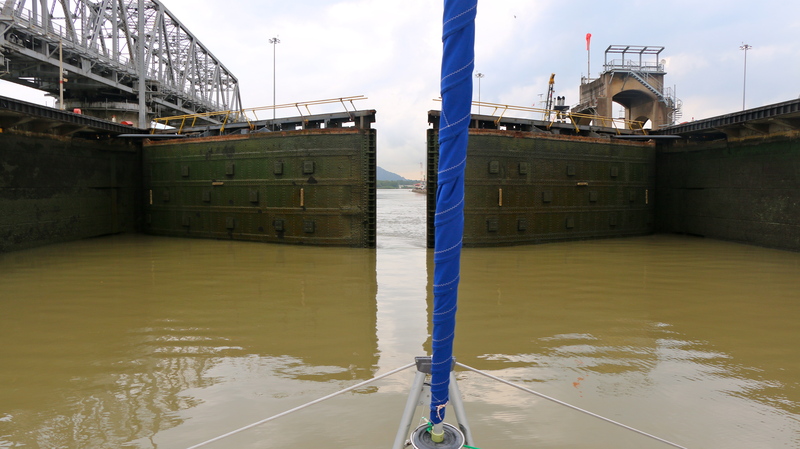 For this lock we were rafted to a tug who was tied “sidewall” in the lock. Another easy operation for the Oceanna crew. 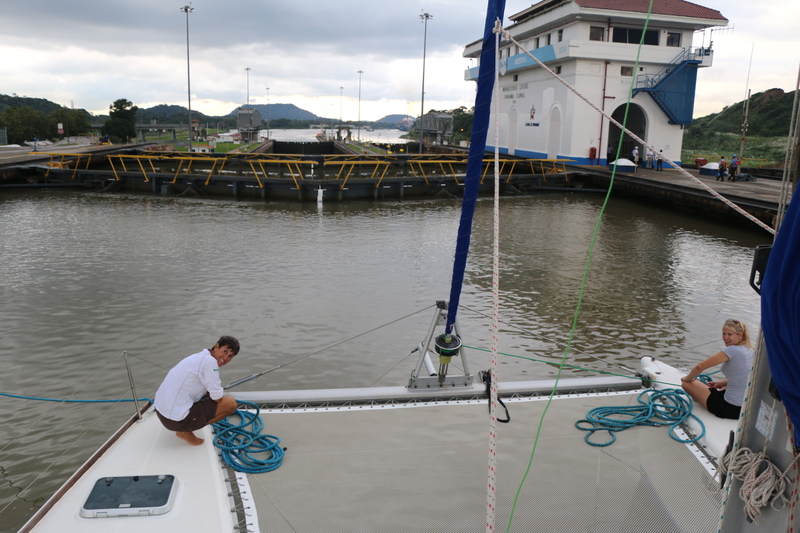 Following the single lock at Pedro Miguel we had a short motor across Miraflores Lake to arrive at the final two locks. 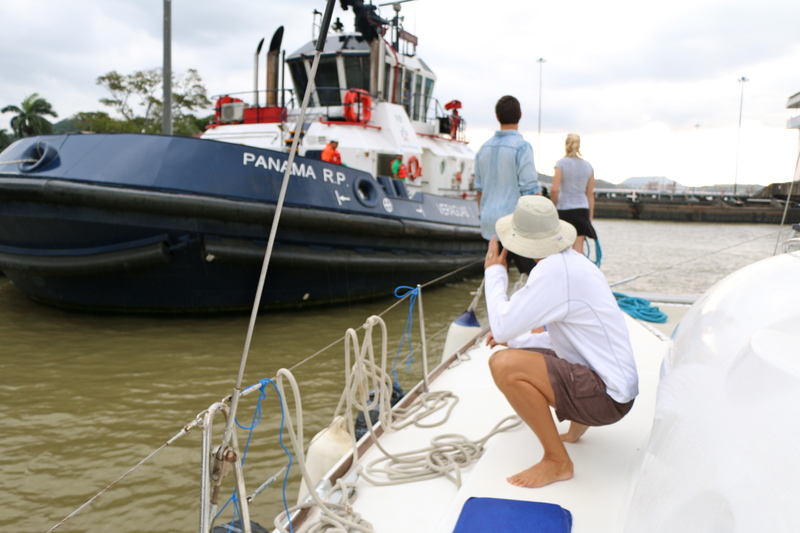 The Miraflores Locks are located just outside Panama City and have a large visitor center and restaurant. Therefore, the top balconies of the multiple story building looking over the locks were loaded with people. 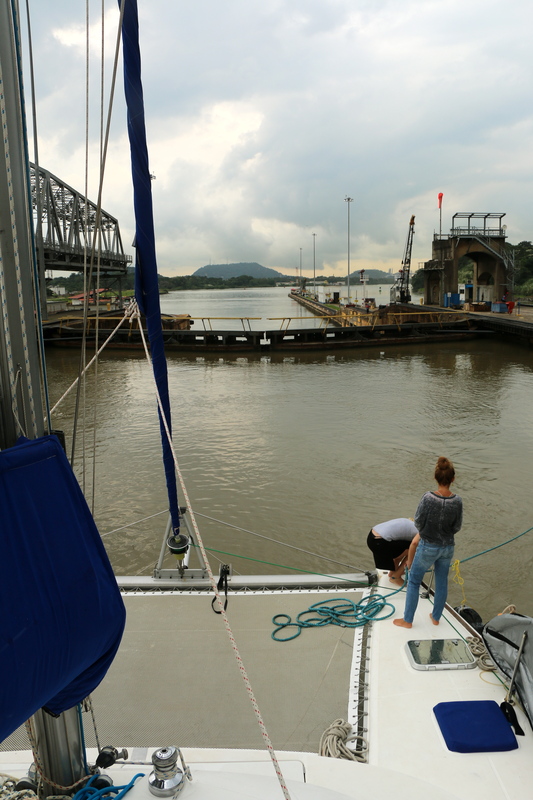 Oceanna was position front and center in the locks for transit, so it was pretty easy to feel pretty important with everyone waving and snapping pictures. 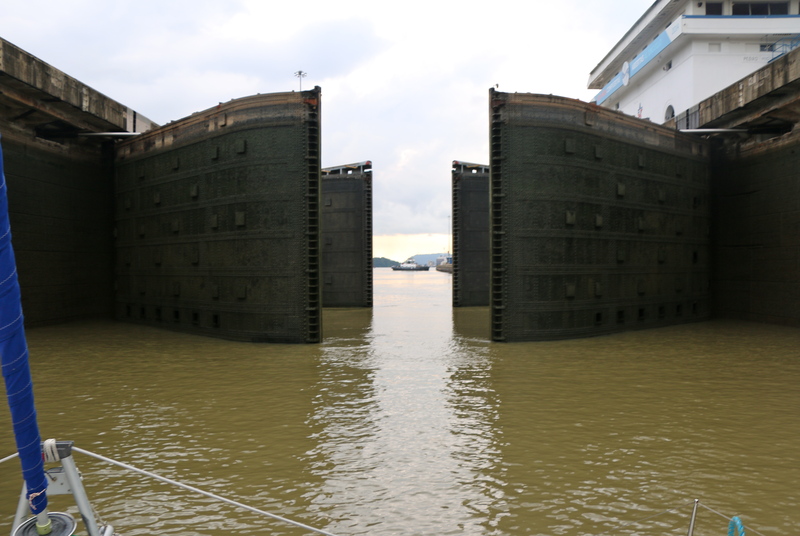 For the final two locks Oceanna would be positioned “center chamber”. Meaning all four of our line handlers were in the action. The process begins with Canal linehandlers throwing lines with heavy monkeyball knots at the end. These leader lines are caught on board and attached to the large lines we had positioned at the four corners, then pulled back to the wall. 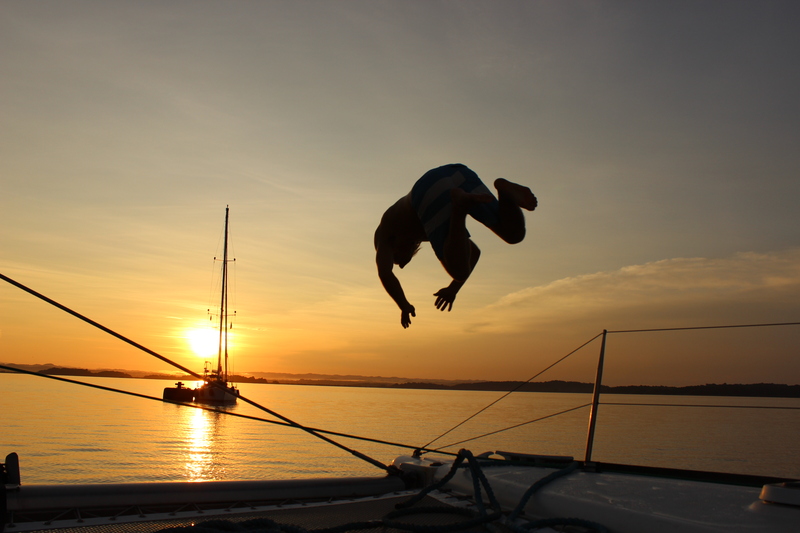 Once each line had a counterpart on the wall it was a smooth operation of walk-the-catamaran into position and tying off relatively center. 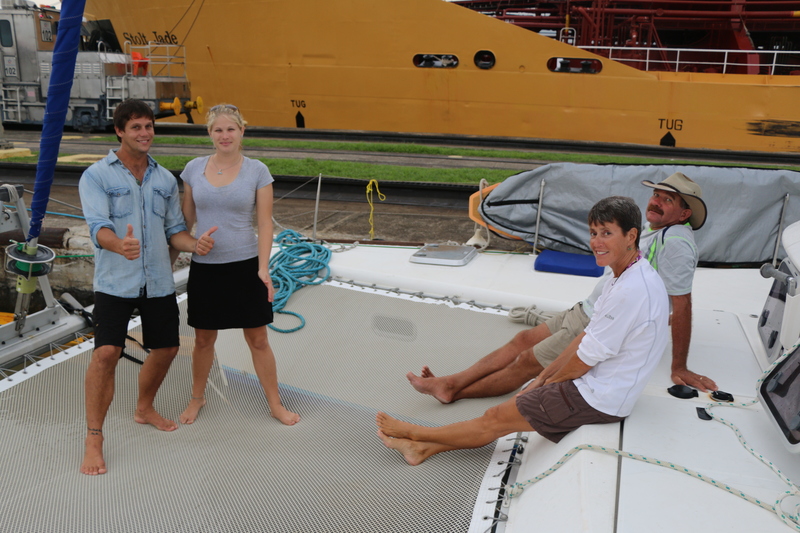 As the water was released from the lock; Jaime, Keith, Kate, and Jason slowly slacked their lines, allowing Oceanna to stay in her center position on the water. In the second lock we had a short discussion about the implications of leaving the lines tied tight and the resulting hovering, disastrous, amusement park-like ride that would follow. We didn’t try it out. After the second lock of the Miraflores set, the doors opened setting free onto the big bad Pacific. 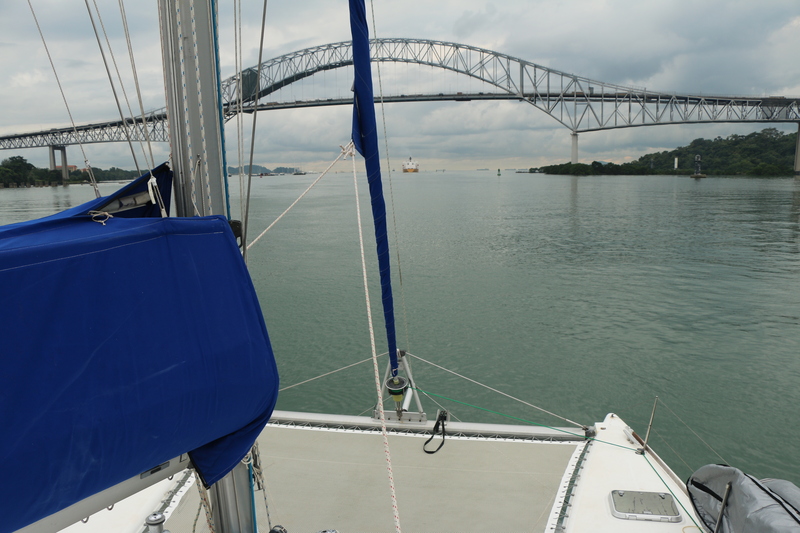 We scooted under the Bridge of Americas, dropped our advisors off, finally setting anchor and popping the champagne. We had arrived! A morning dip to check for crocodilios. 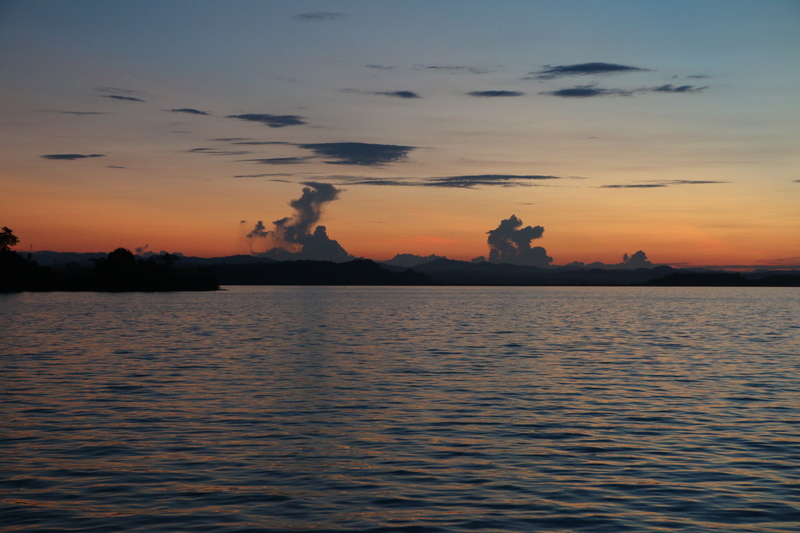 Beautiful 6am sunrise on the lake. Unnecessary hour to be awake waiting for advisors, but rewarding nonetheless. The start of the morning commute. 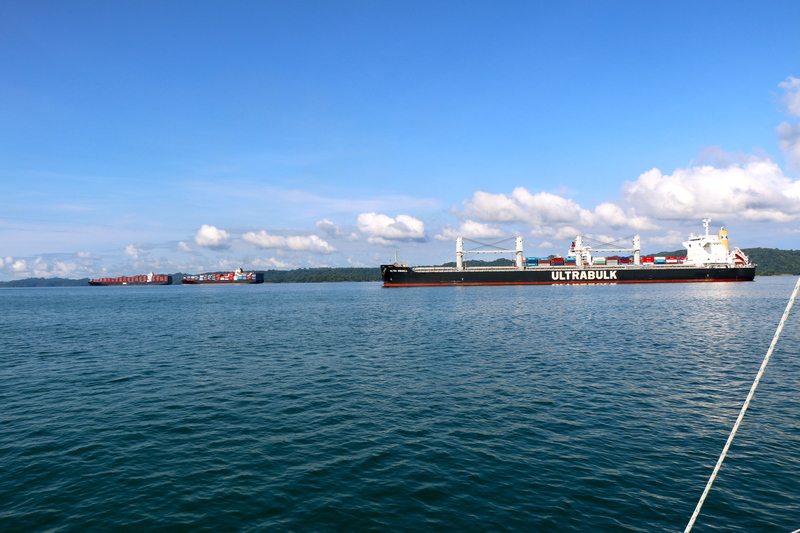 Looking aft at the ships headed south like us, or anchored waiting for their turn on the Gatun Locks to the Atlantic. 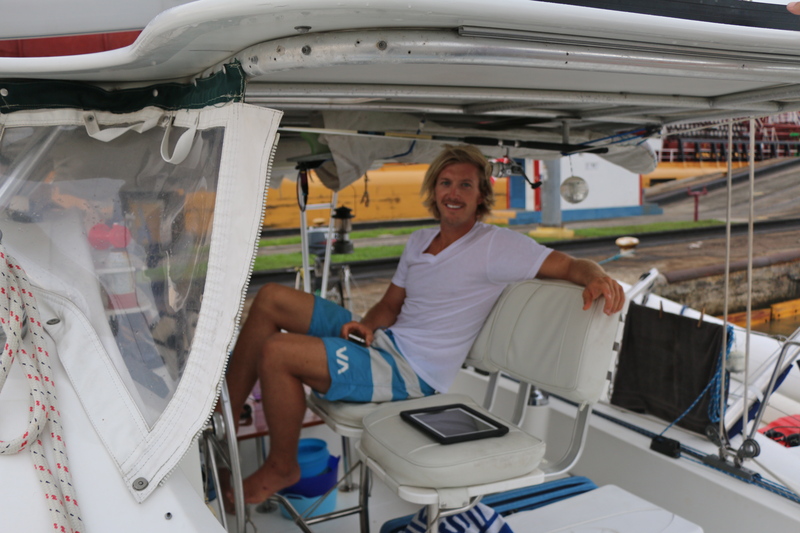 Captain Greg manning the helm. 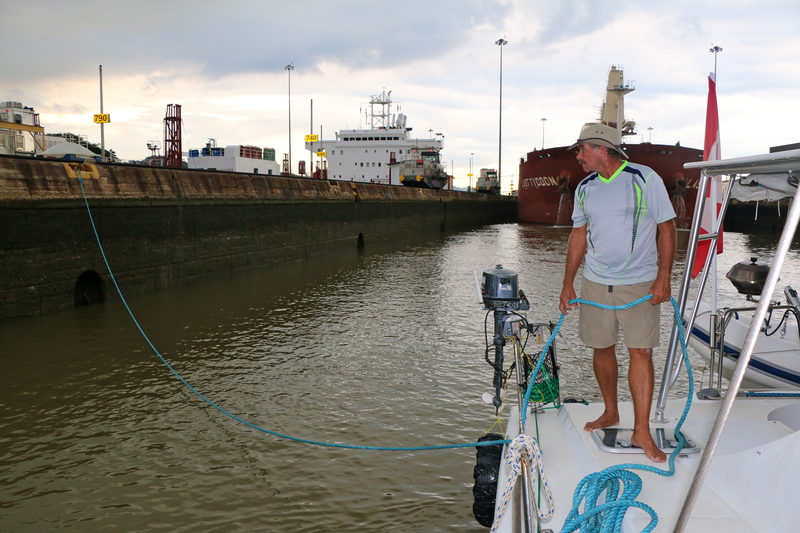 Dodging ships and their large turning radii as we snake our way through the canal. Nothing but blue skies and sunbathers. An absolutely beautiful day. 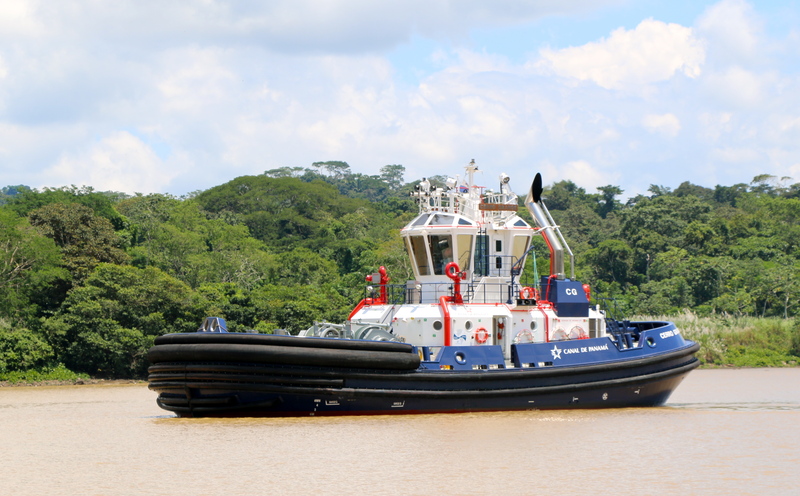 Tugs, tugs, tugs. The worker bees of the canal. 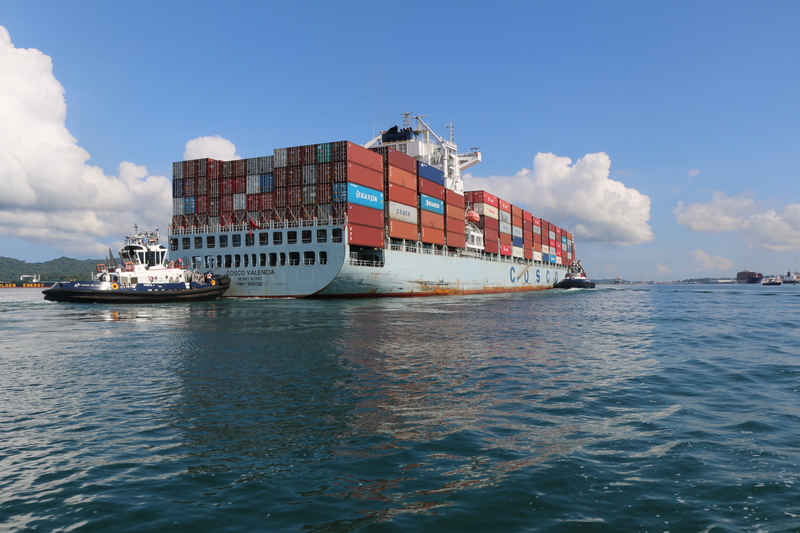 At times the canal route can get quite windy and narrow, making it necessary for the large ships to wait for another to pass. 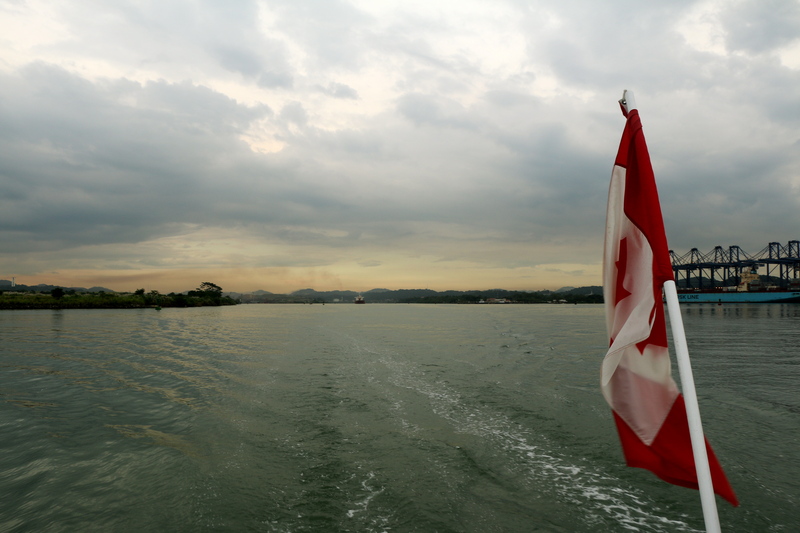 We just stuck to the green buoys on our starboard and skirted ever forward. 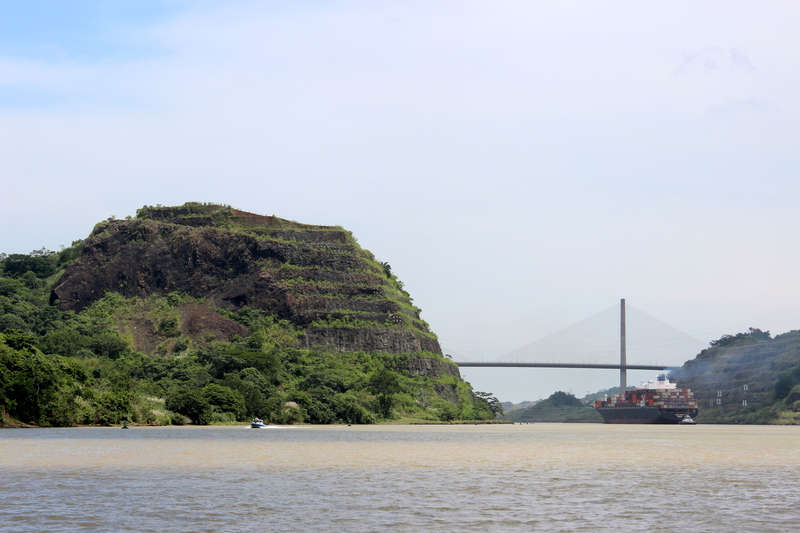 The beautiful Puente del Centenario Bridge in the Galliard Cut. Greg was infatuated by the tugs. So much power packed into such a compact and solid machine. 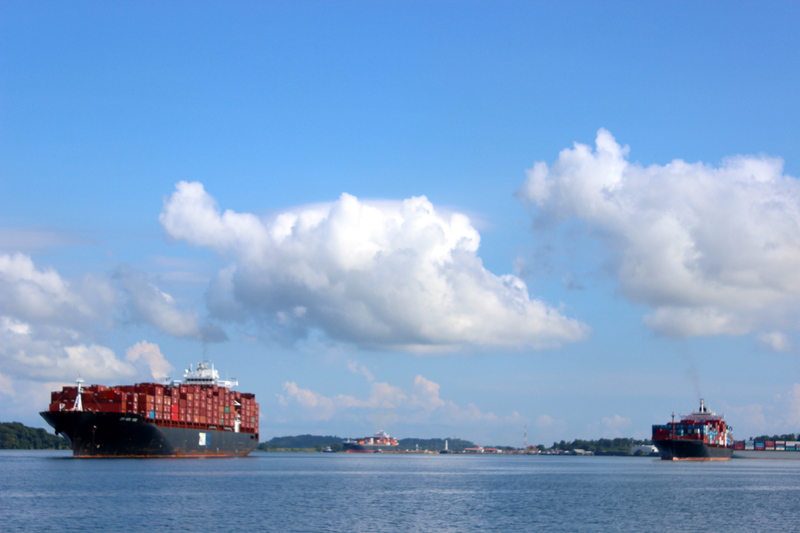 Being overtaken by a container ship. It’s frightening to know they’re going less than half of their regular cruising speed. 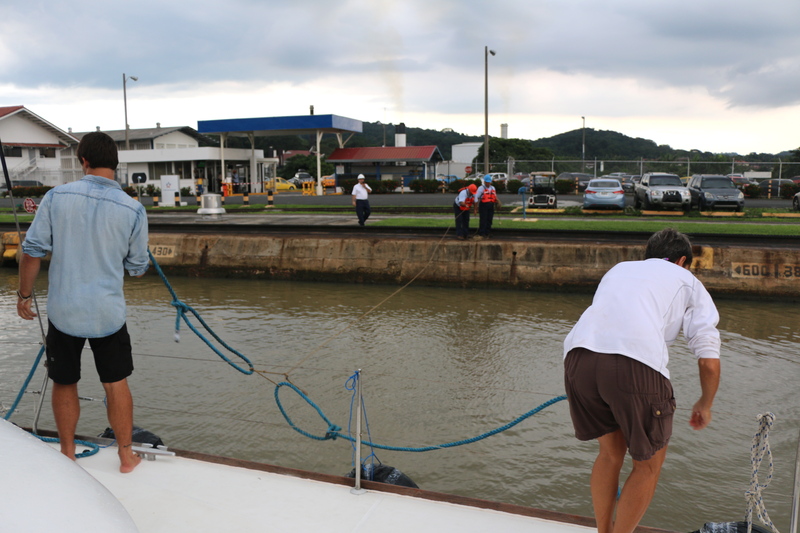 Tying up outside of the Pedro Miguel Lock, waiting for our turn. 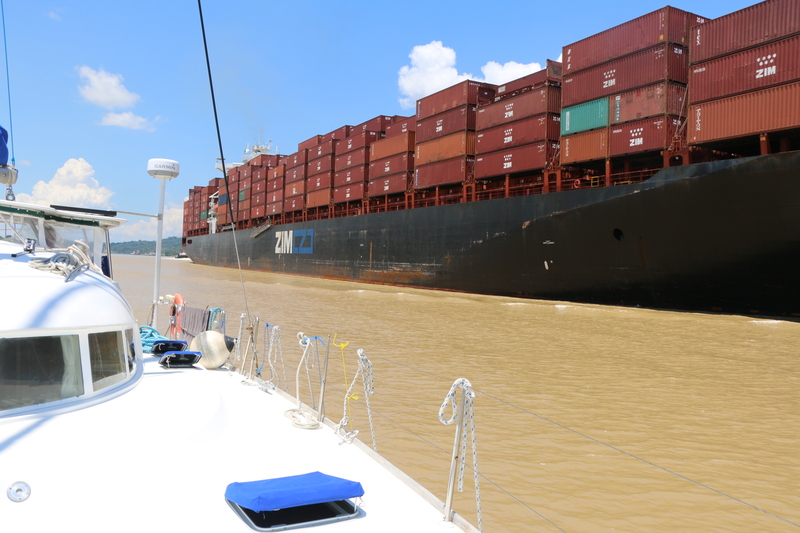 The container ship ahead of us. 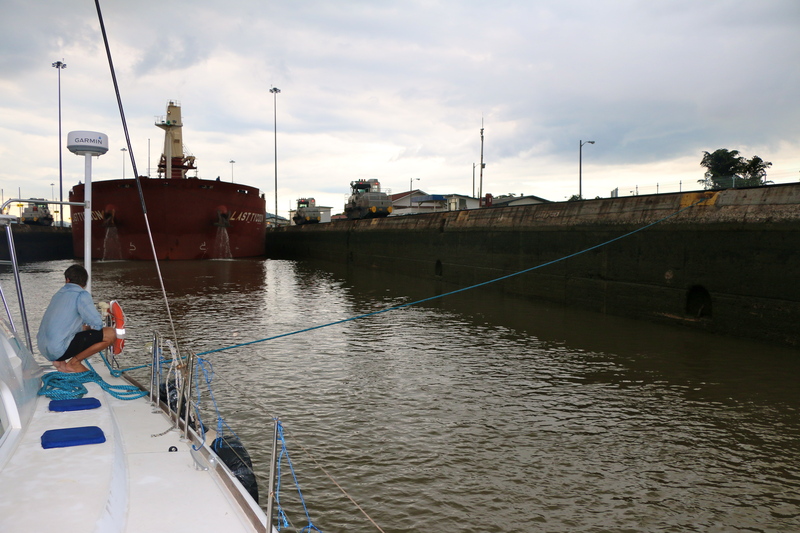 In the Pedro Miguel Lock we tied off to a tug. One lock down and only two to go! Our five-star linehandlers getting stoked to work the four corners for our last two locks. Captain Greg making it all look easy. 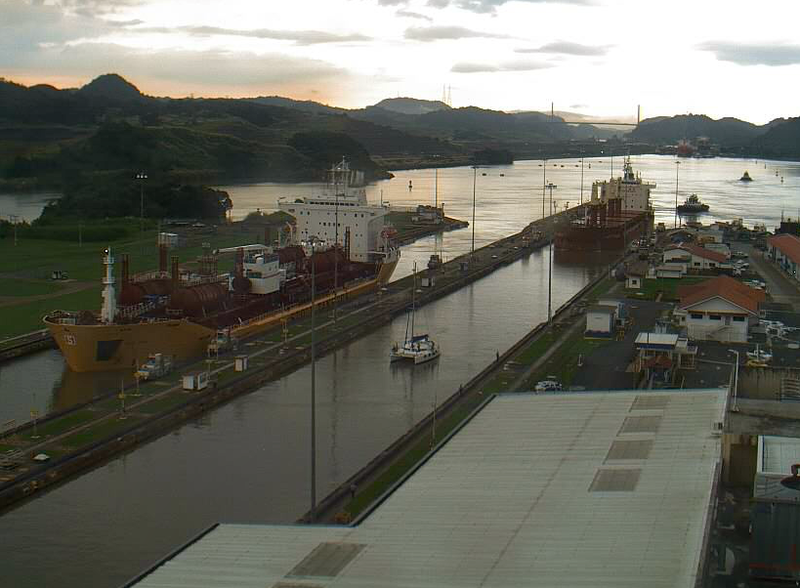 A screenshot grabbed from the Canal Authority webcams as Oceanna enters the Miraflores locks. 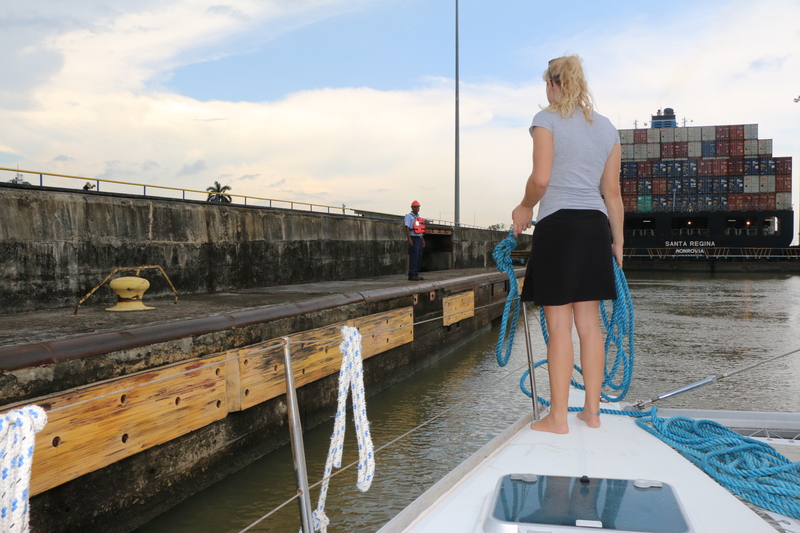 Sending our port lines out to the canal linehandlers on the wall via their leader line. The ladies of the bows. 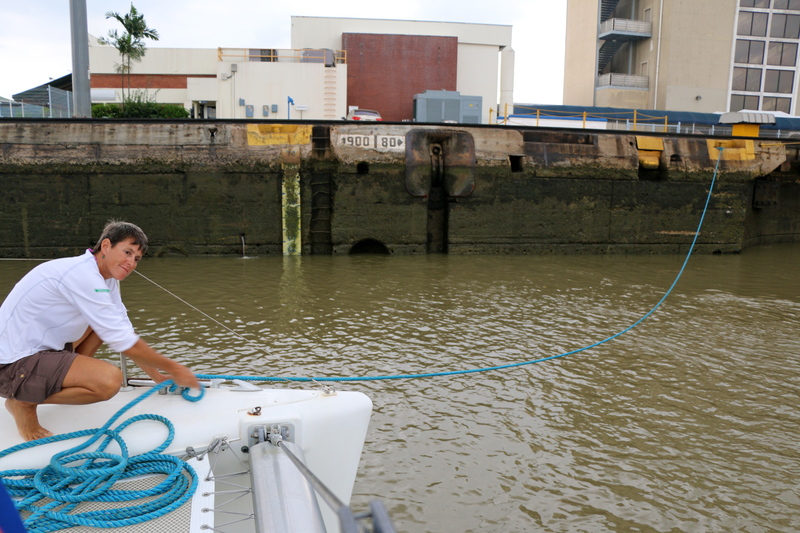 In place and ready to slack the lines as the water begins to exit the lock. A view from the top of our last lock. The Bridge of Americas ahead. Well Done Girl!!! 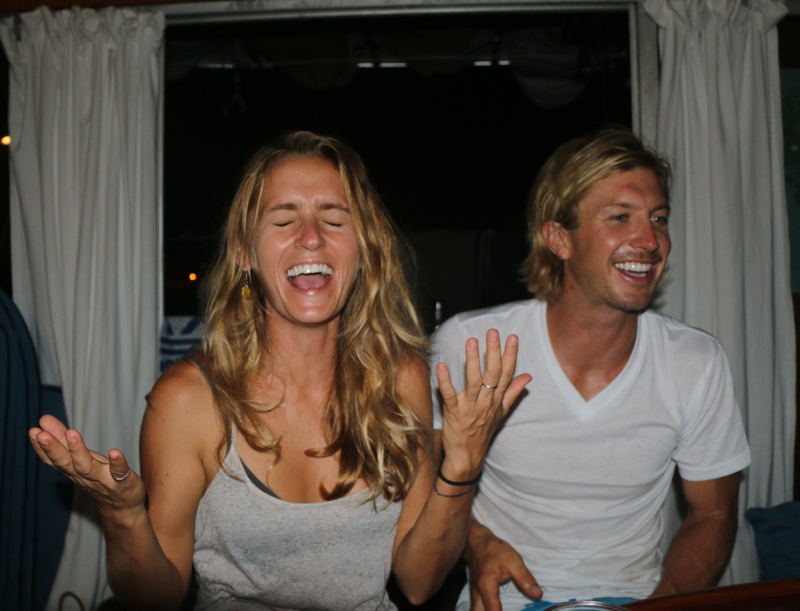 Very entertaining–felt like I was right there!! Wow, this is really neat. 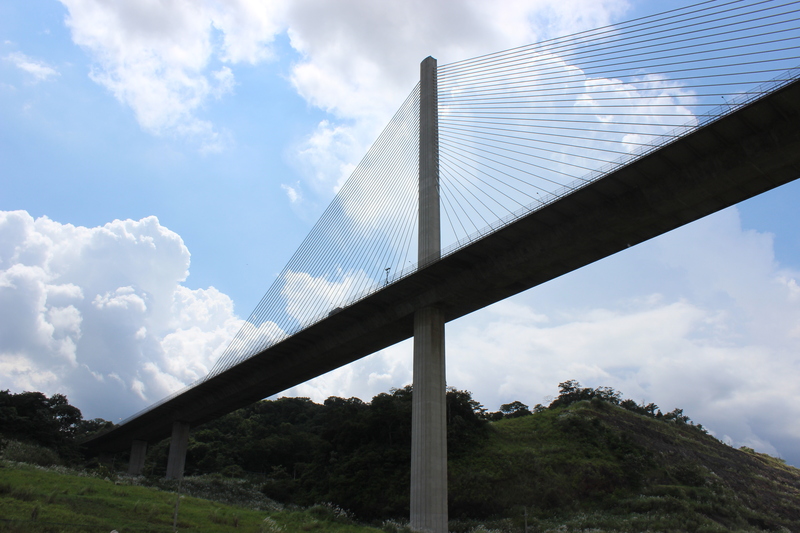 It reminds me of those Discovery Channel shows that detail the engineering/ mechanics behind structures. Well thanks Stu! I sometimes worry that my ramblings only make sense to me. The fact that you were entertained is a plus. Thank you for sharing EVERYthing! I so wanted to be there. (This combining marathon seems like it will never end.) It was even exciting following you on the webcams!